If the first episode of Mr Selfridge series 2 reflects the way the rest of this season will go we’re in for a darker storyline this time around. Five years have passed since Harry Selfridge opened the store with a lot of fanfare in 1909. Self-induced marital problems and increasing business troubles seem to still be with the entrepreneur but he’s changed from a white teeth flashing “I’m here everyone!” type of guy to a darker, moodier character. Jeremy Piven's portrayal this time around is a little more serious and the tone has changed too. 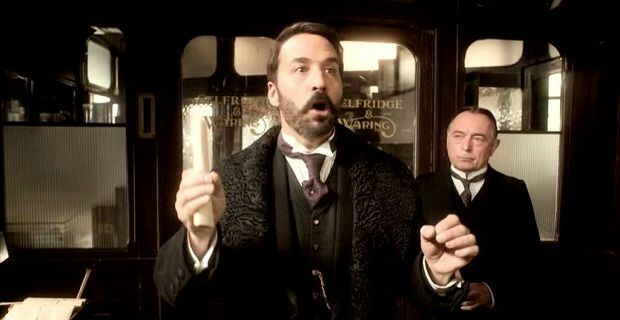 Piven’s brooding Mr Selfridge answers questions with a frown and seems to be unsure of himself. In this episode, Selfridge’s personal life is looking up as his wife returned to him and his son got involved with the business. New cast members Samuel West, Tom Goodman-Hill and Polly Walker add to the fun, but Aidan McCardle’s Lord Loxley looks like the one to watch as his villainous intentions are pretty clear. As you’d expect from the show, sexual tension flourished. Whether you were watching Harry and Mae, Mrs Mardle and Mr Grove or Agnes and Victor, the first episode of the new series promised that season 2 will contain just as much bedhopping as the first. Mr Selfridge is a drama that’s less serious than Downton Abbey, but one that aims at the same audience. It’s probably easier to watch when it’s less serious and yet the writers chose to end the first episode with a reference to the First World War. The headline of a newspaper in the gutter in the show’s final shot read “Archduke Franz Ferdinand Assassinated”. A newspaper vendor shouted out the headline just in case you couldn’t read. We’re not sure exactly how the Great War will play a part in the rest of the series but we hope that it won’t fall as too much of a shadow over a show that should really remain escapist and fun.